The following review may include spoilers, and is solely intended as a discussion piece for the film. Part of what make Short Term 12 (2013) so appealing is the fact it takes a subject matter that has been done over and over again, and it manages to make it fresh and interesting. In almost every instance where a film sets itself in a recovery facility, we are focused upon the patients, or an individual, who is in the midst of their recovery process. Not to say that this isn’t a film about the recovery process, because it is, but the focus of the film is upon those running the facility, and one individual in particular. Grace (Brie Larson) is the perfect central character for this film. Though we never see her journey up to this point, we learn about her past through her interactions with others, whether it be Mason (John Gallagher Jr.) or the kids at the facility. This becomes an effective unveiling, as it seems natural for the tone of the film. For a film that is just a tad over an hour and a half, we gain so much insight without the need for flashbacks, which often becomes a fallback device that other films feel the need to use in order to drive their point home. The dialogue is powerful enough to understand what is happening. Every scene goes un-wasted, and we grow with the characters. Larson is so good in this film, I can’t wait to go back and revisit it just for her performance. I think that I have seen her in other roles, namely Scott Pilgrim vs. The World (2010) and 21 Jump Street (2012), that portray her as an immature youth that has quite a lot to learn about growing up, that it took me aback to see her play such a grown up role as the one she takes on here. She has very little doubt about almost every decision in the film, except for the ones that could potentially make her happy. But she is scared and scarred by her past. We don’t know exactly why until the film plays out completely. I think there is one progression of her character that is absolutely brilliant. We view as she receives the news that she is pregnant from the doctor, and without a second thought, she elects to schedule an abortion. Possibly part of this unwavering decision can be attributed to the fact that she has already been down this road before, as well as her expectation for that sort of confirmation from the doctor of the pregnancy, but it is also somewhat reflective of the kind of “on a whim” decisions she has to make as part of her daily job. This is exactly how her character is most of the time, but every so often she will begin to let her guard down, only to experience the uncomfortable memories of her past, and trust issues. We watch as she lets Mason know that they are going to have a baby, and the bouncing emotion that transpires as he comes to terms with the reality of the matter, only to be a loving, and comforting partner for her in a matter of seconds. For that moment it seems as the she has rescinded her authoritative decision to go through with the abortion, but as she struggles with the emotion that’s being held tightly inside, Mason is quickly closed out from her life, as she can’t let go of the past. She is reminded of it daily, as she watches the kids struggle with the same things. But her desire to help these kids release the demons that are possessing them, and see them grow from their struggles, helps her to come to terms with hers. And in the end, the catharsis that is released as a member of the audience, when she allows herself to accept Mason as a trustworthy partner to be open with, is a powerful one. Though this film is heavily a character study of Grace, and Larson is the main reason that this film is so successful, it doesn’t come across as so outstanding without its cast of amazing supporting characters, and the actors that play them. Most notably is Gallagher Jr., and his unrelenting love for Grace. You truly get why she would want to be with him, and why even though she is closed off, she struggles to completely shut him out. There is something to be said about playing opposite a character that isn’t completely there, but Gallagher Jr. manages to create a chemistry between the characters that at times is for the both of them. Some how it works. The entire film, you are rooting for them to work out, and mainly because he is heavily invested in their relationship. It would be a travesty to not mention Keith Stanfield in the part of Marcus, and Kaitlyn Dever as Jayden. Both of these characters played a pivotal role in Grace’s breakthrough. I can’t even imagine being a teen that is being tortured by an emotionally damaged past, but both of these actors have captured that essence perfectly. Stanfield as a young man scared to re-enter the world that put him in this facility, while giving up the security he has grown close to over the last three years. Dever as a girl struggling to become a woman as she tries to separate herself from her abusive father. Both of these performances are devastating but powerful and great. Director and Writer, Destin Cretton, needs to be applauded for letting his characters and actors do the talking. There are often writers and directors that get in the way of the characters, and don’t let them tell the story. In this case, Cretton stays out of the way to create quite an effective experience. As talked about earlier, I especially liked the fact that Cretton didn’t take the shortcut, and write in flashbacks. He challenged himself as a writer to find other creative ways to tell the history of Grace and the others without having to show us. I don’t want to give off the impression that I hate flashbacks, but I don’t think it is always necessary, and I think they can be used as a crutch. Cretton made an example of how to do it, and not force the dialogue, which is a difficult task. Another thing that I am a huge sucker for is when a film opens a certain way, and then it closes in a way mirroring that opening. This film does just that, and it was a wonderful caper to a film that I thoroughly enjoyed. Despite the obvious placing of the mirroring effect as such, it works in some cases, and it did brilliantly here. Upon final review of Short Term 12, I can’t find many faults with the film. That is quite rare for me. I suppose upon repeated viewings, I will find things to gripe about, but just this once, I enjoyed it for what it was. At times, I thought it might leave me broken-hearted, and cathartically jammed. But it did not. It was exactly what I want from a drama, and my only complaint was that it could have been longer. I wanted to know more about these characters and people that I became wrapped up in over the course of 90 minutes. But that is part of its charm. It gives you just enough to build an intriguing story, and realize that this is but a chunk of these characters lives, and not meant to follow their complete progress. 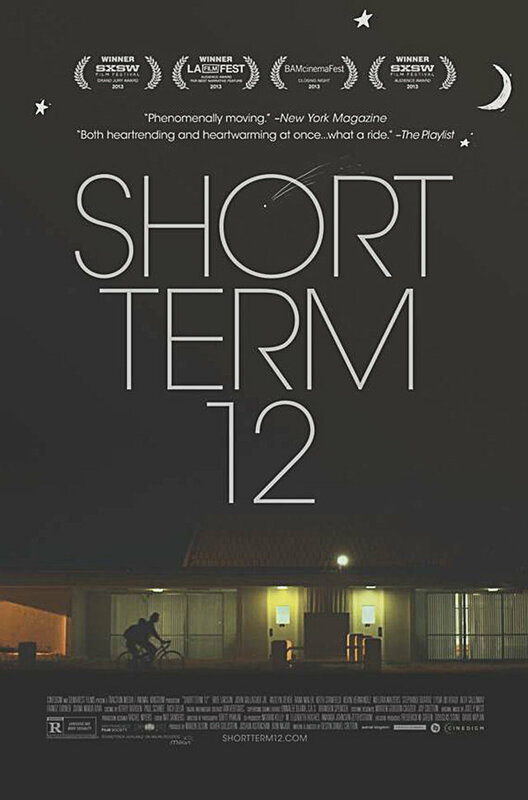 I was left thinking that it would have made a wonderful TV series that I no doubt would enjoy watching, but that would have cheapened the techniques that made Short Term 12 special.